MAKATI CITY – The Philippines and China entered a contract for the Project Management Consultancy (PMC) of the 639-kilometer Philippine National Railways (PNR) South Long-Haul Project (a.k.a. PNR Bicol) on Saturday, 17 November 2018, at the Chinese Embassy Economic and Commercial Section at South Forbes Park in Makati City. The contract was exchanged between Department of Transportation (DOTr) Secretary Arthur Tugade and China Railway Design Corporation (CRDC) Chairman of the Board Liu Weiqun yesterday, 20 November 2018, at Malacañang Palace, and was witnessed by Philippine President Rodrigo Duterte and Chinese President Xi Jinping. Secretary Tugade and Undersecretary for Railways Timothy John Batan signed on behalf of the Philippine government, and CRDC Chairman of the Board Liu Weiqun for the CRDC and Guangzhou Wanan Construction Supervision Co., Ltd. (WACC) Consortium of the People’s Republic of China. 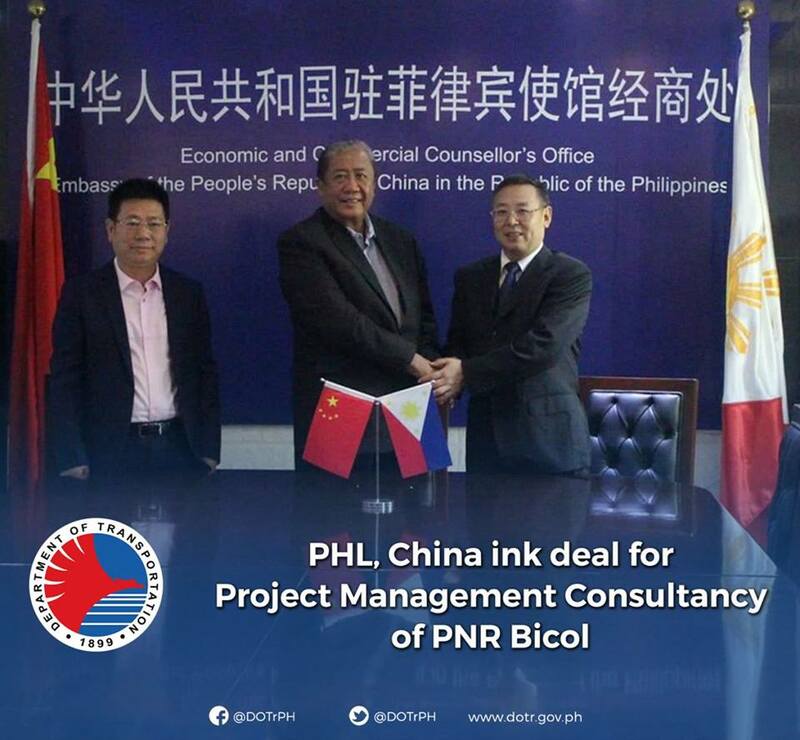 The contract signing was witnessed by Economic and Commercial Counselor of the Chinese Embassy to the Philippines Jin Yuan, DOTr Undersecretary for Finance Garry De Guzman, Undersecretary for Legal Affairs Reinier Yebra, Undersecretary for Planning Ruben Reinoso, PNR General Manager Junn Magno, and CRDC Director Yang Xudong. 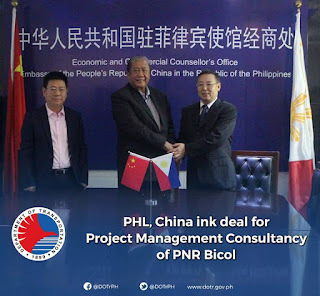 The National Economic and Development Authority (NEDA) Board previously approved the financing of the PNR Bicol Project through Official Development Assistance (ODA) from the Government of China. The PNR Bicol Project is one of the flagship projects of the Duterte Administration under the “Build, Build, Build” Program. Upon completion, the PNR Bicol Project will connect Metro Manila, Region IV-A (Calabarzon), and Region V (Bicol), reducing travel time from Manila to Legazpi City from 13 hours to under 6 hours. “The contract marks a milestone for the PNR South Long-Haul Project. Hereby, I commit that the CRDC and WACC Consortium will fully dedicate to the project, allocate the best resources, and do our best to perform the PMC services according to the contract stipulations and the requirements of the DOTr and PNR. We will contribute to make this important government-to-government cooperation project a high-quality elaborated project,” Chairman Weiqun said. As with other ODA-financed projects, the DOTr engaged a PMC (also called a General Consultant) to provide consultancy services on technical and commercial matters concerning a project. Being a China ODA-financed contract, the selection of the PMC was based on a list of qualified and experienced bidders, as endorsed by the Chinese government. For the PNR Bicol Project, the CRDC-WACC Consortium will conduct all pre-construction surveys (topographic, geotechnical, hydrological, parcellary, environmental, etc. ), preparation of designs for bidding, preparation of bidding documents, bidding assistance, construction supervision, and defects liability period (warranty) supervision. “I am very happy with our partnership with the Chinese Consortium, as this is our first contract with China for our railways sector. I am hoping that we continue this arrangement for more projects, including our Clark to Subic Railway project that I am hoping to be signed before the end of the year,” Secretary Tugade said. “We will continue to improve our nation’s railways to better provide the riding public mobility and connectivity, and with the support of the Chinese government, we move closer to delivering President Duterte's promise of a more comfortable life for every Filipino,” Undersecretary Batan added.